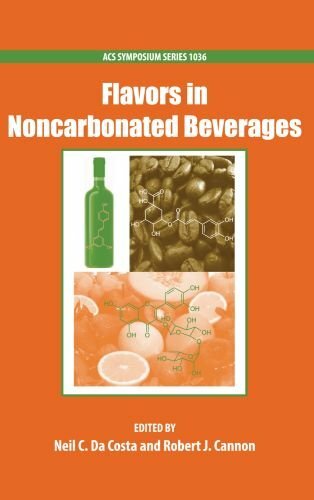 Flavors in Noncarbonated Beverages is based upon the symposium entitled "Flavors in non-carbonated beverages" presented at the American Chemical Society (ACS) 236th National Meeting in Philadelphia, Pennsylvania on August 17-21, 2008. The symposium was sponsored by the ACS Division of Agriculture and Food Chemistry. In recent years, there has been a great increase in the production and consumption of non-carbonated beverages as dictated by consumer preference. In contrast, carbonated beverage sales have remained static or even in decline. With more discerning and informed consumers, the interest has been in ready to drink (RTD) beverages and beverages exhibiting certain health beneficial properties such as antioxidant activity. This Symposium Series book describes various aspects of recent research and developments related to non-carbonated beverages. These include the volatile and non-volatile composition of teas, coffees, fruit juices, flavored waters, energy drinks and alcoholic beverages. In several chapters, the emphasis is on topical non-volatiles such as polyphenol antioxidants. The introduction describes trends in consumption of certain non-carbonated beverages. Increased consumption of these beverages is a trend that is likely to continue for the foreseeable future. Neil C. Da Costa is Senior Research Fellow at International Flavors & Fragrances Inc. He is a Ph.D analytical and organic chemistry group manager leading a group of six analysts in flavor research and business. Robert J. Cannon is Research Scientist at International Flavors & Fragrances Inc. He received a BS degree in Chemistry from Haverford College in Haverford, PA.